The month is up and we have completed yet another mega marathon when we blog for 26 days of a month with a pre-decided theme. This time we blogged about 26 flatbreads – Indian / International or Dosas/ Pancakes. I chose the dosa/ pancake option and made 26 types of dosas, one for each letter of the alphabet from A-Z. I discovered some amazing recipes from across the country and had a ball making these amazing, tasty, dosas. It has been a fun and enriching experience to learn about dosas and pancakes from various states of India. 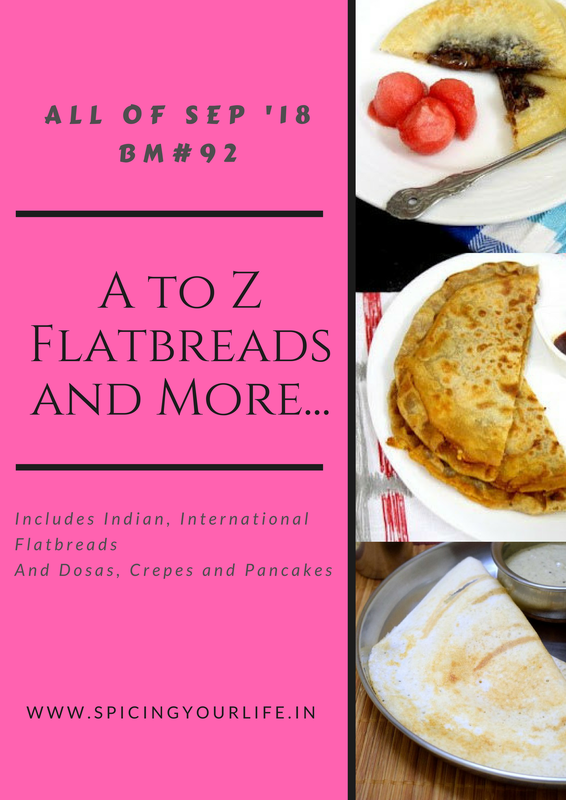 Check out the other BMers blogs in the linky tool below for a wide variety of Indian and international flatbreads. Sowmya , it has been a great learning experience . When I look back on these Dosa’s , I wonder if I could have faired so well in this Dosa Marathon . Kudos you have rocked , though even I was expecting international Flatbreads from you , but seriously the complete marathon has been absolutely fantastic . Fantastic roundup Sowmya, each one so beautifully done!..and its really wonderful you managed on daily basis..this will be a most sought out roundup for sure! Somwya, I wish I lived near you, I would definitely come to you to learn how to make big crispy dosas. Loved your collection of flatbreads and didn’t know that there was a huge variety of dosas. Thank you so much for sharing very interesting recipes. wow such a beautiful journey came to an end. Loved running with all of you. Got to know more a little about you via stories. Thanks. Sowmya, each and every dosai recipe of yours was amazing and so unique. I have learned so much about ingredients that I would have never thought of using it in a dosai. Loved the whole series and hats off to you to completing it successfully! Incredible roundup Sowmya.. U came up with so many incredible and unique dosas for this Mega Bm. I have bookmarked few and will surely make them very soon.